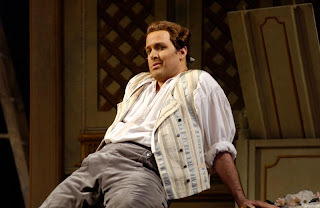 Yesterday I accused all the characters of Le nozze di Figaro (save the Countess) of narcissism, and I hasten to add that this is particularly true of Figaro himself. It was more extreme when Figaro was a little younger, in The Barber of Seville, back in the days of “ ‘Figaro!’ ‘Figaro!’ ‘Figaro!’ Everybody wants me, everybody loves me!” And, most of all, myself. Above, Oren Gradus, who debuts at Seattle Opera Saturday night, sang Beaumarchais' roguish alter-ego in Houston in 2005. Generally, a narcissist is anyone better-looking than you. But with Figaro it’s also manifest in his constant need to be the center of attention. Everytime he comes onstage he manages to make the drama all about him -- how smart he is, with his schemes and intrigues, how funny he is, with his incessant need to act out (and sing out!) everything under discussion, from the tinkling of the Countess’s bell -- “din! din!”-- to the glories of Cherubino’s future military career, to the imaginary pain in his twisted ankle. It’s entertaining to watch the antics of such a fellow; but in real life people like that are hard to live with. I can’t say I envy Susanna. Figaro's previous aria, in contrast, is ingeniously witty, both text and music. 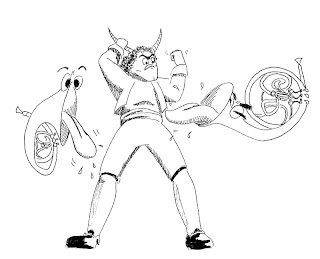 This is “Non più andrai," one of Mozart's most infectiously delightful melodies. Back on April 13th (below) I posted both its foppish, prancing opening and the jolly march that it becomes. Of course this aria is about Cherubino, about Figaro and the Count recruiting this odd boy/man-woman to join their team in the game of women vs. men; but in this aria Figaro is also declaring war on the Count: "No more fluttering about all day and night bothering the ladies, you great big lovesick butterfly, you little Narcissus, you little Adonis of love." (Da Ponte's diminutives are even more adorable in Italian.) The Count has committed the first overt act by banishing Cherubino, who is threatening his status as alpha male around the castle. Figaro sings this aria by oblique way of saying to the Count, à la Daffy Duck, "of course you realize...THIS MEANS WAR!!!" Figaro is far too crafty and cunning an eighteenth-century intriguer ever to confront his master head-on. (The closest he comes are the cheeky lines, "My face might lie, but I don't” in the Act 2 quartet, and "I never dispute what I know nothing about," opening the Act 3 finale.) He explains his policy in his Act 1 aria, "Se vuol ballare": If his little Lordship wishes to dance, I'll teach him the steps. I love this aria, particularly the part where Figaro almost loses control and starts whacking the Count with forte repetitions of "Saprò!" (which basically means "Yes, I can!") before catching himself and reining in his anger with repetition of the word "Piano" (quietly, i.e. through subterfuge). He then launches into a little patter-song of feints, parries, dodges, and attacks before repeating his ominous -- and thrilling -- minuet. Figaro has a lot to sing and a lot to do in this opera; he should be charming, infuriating, adorable, obnoxious, and in the end pushed to the limit of his own conceit and beyond. Hi Jon: the two clips on this blog entry appear to be the same aria (the one with the French Horn's at the end) from the same recording - at least they sound identical to my ears. D'oh! Sorry about that...I blame this one-handed blogging, too much copying and pasting. It's fixed now.